Heritage Community Foundation (HCF) is a 501(c)(3) entity that provides funding to local nonprofit organizations within the Southern Crescent of Atlanta. Specifically, the foundation serves Clayton, Henry and Fayette counties. Heritage Bank employees are the primary contributors to the foundation. See a list of other partners helping sponsor the Heritage Community Foundation. Heritage Community Foundation provides the needed funding for nonprofits in our local market. See a list of recipients. Get involved with HCF. See a list of events that are coming soon. Right back into the community we serve. Our operating costs are covered by Heritage Bank, so 100% of your donation goes to the nonprofits we support. How can I donate to the HCF? Simply click on the Donate Now button below to get started. We are conveniently located at Heritage Bank, 203 Keys Ferry Road, McDonough, GA.
What are the guidelines for applying for a grant? Visit our Grants Guidelines page to find out more. Heritage Bank launched the foundation January 1, 2015. How many serve on the Board of the foundation? Eight employees representing each area of the bank serve a two-year term with the foundation. Since 2015 over 100 Not-for-profit Agencies in Clayton, Henry, & Fayette Counties. 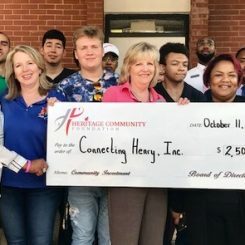 The Heritage Community Foundation (HCF) aims to provide financial and leadership support within the community through a combination of efforts from individuals, local businesses and other community leaders. By doing so, the HCF assists those qualified nonprofits within our service community that have methods to provide good works and support to those truly in need. As ambassadors to the community, HCF pledges a commitment to serving through a tradition of excellence. The Board of Directors, led by Executive Director Mark Dose, consists of Heritage Bank employees representing all areas of the bank who strive to impact our community in an amazing and positive way.